MLB Pipeline No. 1 overall prospect Vladimir Guerrero Jr.’s AFL average dropped to .351 after a 1-for-4 performance that included an infield single to third base and a pair of swinging strikeouts. Zach Jackson allowed one run on one hit and two walks with one strikeout out of the Saguaros’ bullpen. Steve Wilkerson boosted his Fall League average to .300 with a 2-for-4 afternoon. Ryan McKenna, the Orioles’ No. 16 prospect, went 0-for-2. Lucius Fox, the Rays’ No. 9 prospect, hit a single in his first at-bat to increase his hitting streak to eight games before finishing 1-for-5. The shortstop sports a .329 average with 15 runs scored in 18 games this fall. Bobby Dalbec, Boston’s No. 6 prospect, struck out twice and walked in three trips to the plate for the Solar Sox. He’s hitting .194 with a .713 OPS in the Fall League. Josh Taylor posted a scoreless inning with one strikeout in relief. Yankees No. 2 prospect Estevan Florial has had a rough AFL, but did collect a pair of hits on Friday. Florial went 2-for-4 and also drove in a run. Thairo Estrada (No. 16) went 0-for-3 and scored a run. Steven Sensley went 0-for-4. Jordan Foley twirled a strong start for the Desert Dogs. The right-hander walked four, but yielded just one run on three hits through four innings. Matt Wivinis and Hobie Harris followed Foley to the mound and each threw an inning. Wivinis retired the side in order, Harris gave up one run on one hit, but notched a trio of strikeouts. Indians No. 6 prospect Yu Chang finished just 1-for-4 at the plate, but also drove in a pair of runs. Li-Jen Chu went 0-for-2, but drew a walk and scored a run. Dalbert Siri and Rob Kaminsky each threw in relief. Siri gave up one run on one hit in one inning, while Kaminsky faced just two batters, walking one and retiring the other. Nick Heath tallied an opposite-field single in three trips to the plate from the bottom of the order for the Saguaros. On the mound, right-hander Arnaldo Hernandez pitched around three walks in the fifth inning to complete a scoreless frame. Tigers No. 8 prospect Daz Cameron has swung a hot bat this fall, and that continued when he delivered a walk-off hit to cap a 2-for-5 performance that included a stolen base. With the multihit performance, Cameron pushed his average to .338. Catcher Jake Rogers (No. 12) paced the offense with two runs scored as part of a 1-for-3 performance that included his third double. On the mound, Solar Sox starting pitcher Gregory Soto (No. 14) allowed two runs (one earned) over four innings to lower his ERA to 2.88. He mixed three hits with three walks and struck out a pair. Eduardo Jimenez took over for Soto in the fifth inning and delivered two hitless frames with a walk and two strikeouts. Sandy Baez (No. 26) didn’t fare as well in the ninth, allowing two earned runs on three hits, though he did record his second AFL victory after Cameron won it for Mesa. Griffin Jax was sharp in his longest Fall League outing, tossing five innings of two-hit ball during which he allowed just one run. The right-hander issued two walks, struck out five and generated seven ground-ball outs while throwing 44 of 78 pitches for strikes. Adam Bray and Hector Lujan both struck out the side but also gave up an earned run during their respective innings out of the bullpen in relief of Jax. A’s No. 18 prospect Eli White, starting at shortstop for Mesa, plated a run with his second AFL double, his lone hit in four trips to the plate. Skye Bolt (No. 30) reached base twice in the contest, going 1-for-3 with a walk, an RBI and two stolen bases. They’re batting .334 and .244 this fall, respectively. Jahmai Jones, the Angels’ No. 4 prospect, reached via a walk and tallied his fifth AFL double while going 1-for-3 from the two-spot in the lineup. Neither third baseman Roberto Baldoquin nor first baseman David MacKinnon collected a hit, as they together went 0-for-7 with four strikeouts, three of which belonged to MacKinnon. Astros No. 2 prospect Forrest Whitley didn’t receive much help from his defense. The right-hander was charged with five runs in four innings, however just one of the runs was earned. Whitley also walked two and struck out four. Trent Thornton (No. 24) and Erasmo Pinales followed in relief and each threw a scoreless inning. Hitting atop the Scottsdale lineup, Drew Ferguson went 1-for-4 with a double. Robbie Dawson entered the game as a pinch-hitter, but was hit by a pitch in his lone plate appearance. Abraham Toro-Hernandez (No. 21) also entered as a pinch-hitter and drew a walk. Evan White, Seattle’s No. 2 prospect, reached base three times via two walks and an opposite-field single to finish 1-for-2. Ian Miller (No. 20) and catcher Joe DeCarlo both went 0-for-2 but walked twice. On the mound, Javelinas starter Anthony Misiewicz (No. 28) took a no-decision despite tossing four blank frames of two-hit ball with four strikeouts. The left-hander has pitched to a 2.76 ERA with 13 strikeouts and four walks across 16 1/3 frames (five starts). Right-hander David McKay tossed a perfect seventh inning with one strikeout out of the bullpen. Yanio Perez put Surprise on the board with a ninth-inning RBI single, his lone hit in four trips to the plate. Charles Leblanc, meanwhile, was held hitless, going 0-for-4. The two players are batting .211 and .306, respectively. Joe Barlow issued a walk before recording the third out in the eighth inning after entering in relief. Braves No. 6 prospect Cristian Pache (No. 68 overall), batting cleanup for the Javelinas on Friday, worked a pair of walks and scored a run as part of a 0-for-2 showing. Reigning AFL Hitter of the Week Braxton Davidson delivered a two-run single to center field with the bases loaded in the eighth inning to extend Peoria’s lead. He finished 1-for-3 at the plate and now has 13 RBIs this fall. Marlins No. 2 prospect Monte Harrison went 0-for-4. Brian Miller (No. 12) entered the game as a pinch-runner, but didn’t record an at-bat. Bryson Brigman (No. 27) doubled his RBI total as he went 1-for-3 with two RBIs and has now driven in four runs in the AFL. Kyle Keller was stuck with the loss for the Rafters after giving up one run on two hits in the bottom of the ninth. Phillies No. 11 prospect Arquimedes Gamboa went 1-for-2 with a walk as he continues to struggle and is hitting .191 in the AFL. Darick Hall went 2-for-5 and scored a pair of runs, while Austin Listi went 0-for-3 with a walk. Nationals No. 2 prospect Carter Kieboom and Daniel Johnson (No. 7) had rather pedestrian days at the plate as Kieboom went 1-for-3 and Johnson finished 0-for-2. Mets No. 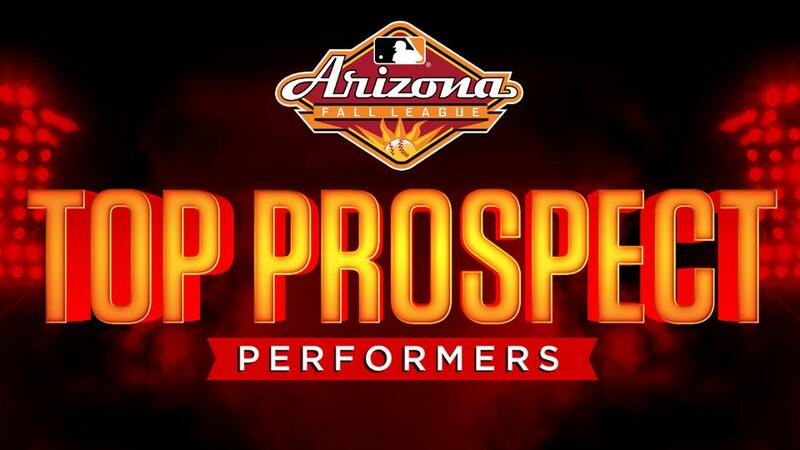 1 prospect Andres Gimenez went 0-for-3 at the plate. Peter Alonso (No. 2) entered the game as a pinch-hitter, but drew a walk in his lone plate appearance. Ali Sanchez (No. 25) entered the game as a defensive replacement and didn’t record a plate appearance. Joe Zanghi struck out one as he worked his way through a clean inning. Brewers top prospect Keston Hiura (No. 30 overall) was held hitless out of the two-spot in the lineup, as he finished 0-for-4 with a strikeout. He’s hitting .325 in the Fall League. Right-hander Miguel Sanchez lowered his ERA to 1.29 and earned his first AFL win after tossing two scoreless frames out of the bullpen. He surrendered two hits, walked one batter and struck out a pair. Switch-hitting shortstop Tommy Edman went 1-for-3 with a single and a walk out of the leadoff spot, while two-hole hitter Lane Thomas finished 0-for-3 with a walk. Catcher Jeremy Martinez went 2-for-4 with a double as he accounted for a quarter of Surprise’s eight hits on the night. Starting pitcher Evan Kruczynski added to his strong fall campaign by allowing just one hit over four scoreless innings. He walked a pair and struck out three.The left-hander’s ERA sits at 1.37 through 19 2/3 frames (five starts) after his second straight scoreless outing. Right-hander Conner Greene (No. 28) struck out the first batter he faced but ultimately allowed three earned runs on three hits and two walks while last just 2/3 innings. Cubs No. 16 prospect D.J. Wilson boosted his average to .160 as he went 2-for-4 and scored a run. Bryan Reynolds, Pittsburgh’s No. 8 prospect, went 1-for-4, and Will Craig (No. 16) plated one of the Saguaros’ two runs with a ninth-inning single to finish 1-for-4. Matt Eckelman issued a pair of walks but otherwise tossed a clean seventh inning in relief. Taylor Trammell, the Reds’ No. 2 prospect, was 1-for-2 at the plate, but also showed solid plate discipline as he drew a trio of walks. Alfredo Rodriguez (No. 23) went 0-for-5 and is hitting just .164. D-backs No. 4 prospect Pavin Smith went 0-for-3 but drew a walk and scored a run. Daulton Varsho (No. 5) scored a run, but was otherwise 0-for-5. Drew Ellis (No. 9) picked up his 12th RBI as part of a 1-for-3 afternoon. Dodgers No. 26 prospect Jordan Sheffield walked one, but picked up his first save of the AFL after throwing a scoreless ninth inning. Jared Walker went 0-for-3. Giants No. 10 prospect Heath Quinn went 0-for-4 with a walk, C.J. Hinojosa (No. 28) entered the game as a defensive substitution in the ninth and Matt Winn went 1-for-2 with a homer, his second of the Fall. Melvin Adon has impressed in the AFL, but gave up one run on three in his lone inning and was stuck with the loss. Padres No. 23 prospect Hudson Potts broke a scoreless tie with an RBI single in the sixth inning and finished 1-for-2 with two walks and a run scored. Buddy Reed (No. 13) drove home a run two innings later with an opposite-field double before finishing 1-for-3 with a walk. RIght-hander Blake Rogers allowed a hit and a walk during a scoreless eighth inning, while Dauris Valdez yielded two earned runs on three hits while striking out the side in the ninth to secure the Javelinas’ victory. Tyler Nevin, the Rockies No. 11 prospect, entered the game as a defensive replacement. Josh Fuentes picked up a pair of hits and is hitting .310 after his 2-for-4 performance.